86/14 cot/poly blend Premium grade Extra soft white hand towels for use in Salons, Gyms, Spas, Hotels and many more businesses. If you are looking for a medium size hand towel this will be the product to go with. Blended Premium Hand Towels Are the Best of All Worlds! Your nail salon business is doing well. But are your hand towels holding up to the day-to-day work? If not, you'll want to check out these amazing wholesale white hand towels! They're premium quality and sized right at 16 x 27. Plus, they offer you a wonderful blend of cotton fibers and polyester that will make jobs faster and more convenient. Of course, when placing your order for your favorite Towel Super Center wholesale nail salon towels, don't forget that they're great for residential uses. For instance, are you looking for hand towels for your own home use? Consider purchasing wonderful white premium hand towels in a cotton/poly blend. 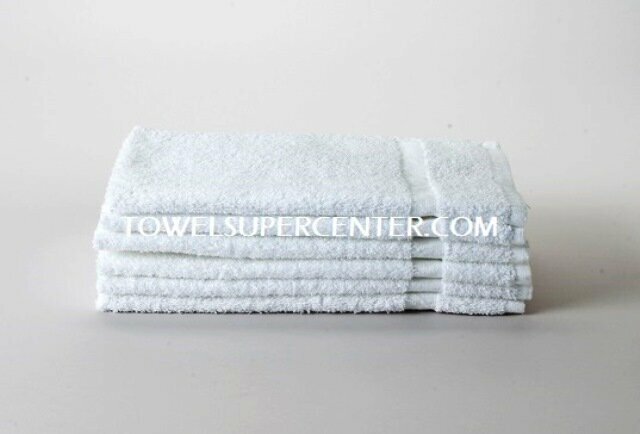 Towel Super Center offers a fantastic value on premium blended hand towels by allowing you to buy as many units of one dozen towels as you need. It’s never been easier or more budget-friendly to fill your linen closet with the best hand towels you can find! It’s soft. Cotton is naturally a comfortable material against the skin. It’s stain-resistant. The blend of cotton/poly resists any types of stains, and releases unwanted marks during appropriate pre-treatment and laundering. It’s durable. You can expect your high-quality, blended premium hand towels to last for a long time. This means you don’t have to constantly buy more! It's odor-resistant. Never worry about your clients complaining that your nail salon towels have an unpleasant smell. Cotton and polyester, when laundered regularly with a trustworthy detergent product, resist holding on to odors and bacteria. What's the secret to maintaining your wholesale white hand towels for as long as possible? Quite honestly, the solution is having a lock-tight system for laundering and storing your towels. Toss your wholesale premium hand towels in the laundry frequently. In fact if you can keep them from sitting wet for more than several hours, you should. This makes it less likely for the towel fibers to break down from exposure to debris, staining agents, bacteria and dirt. Can't take a moment to put your towels in the washing machine? Air dry them to at least promote moisture release. Use a pre-treatment spray on tougher stains. As soon as your wholesale nail salon towels come in contact with a known chemical or staining agent, douse them with your pre-treatment solution of choice. That way, they'll come out of the washer looking better and brighter! Skip the liquid fabric softener. It leaves a film on the towels that can affect their moisture wicking ability. As soon as your wholesale white hand towels are dry, shake them off, fold them up and store or use them. Want to make special monogrammed hand towels as gifts this holiday season? Have an online store where you sell embroidered products? Why pay more than you need to for premium hand towels? These white blended cotton/poly hand towels are suitable for arts and crafts. Just purchase as many as you want and Towel Super Center will deliver them right to your door! It’s never been so simple or inexpensive to show off your artistry or boost your online store’s revenue. Nice towel! We have them long time, hold up well in heat machine.